The Informatics Department at LSBU held a successful networking event on Wednesday 11 February that gave students and staff the chance to meet a variety of entrepreneurs and businesses. The event was held in conjunction with LSBU Research, Enterprise and Innovation at the Clarence Centre for Enterprise and Innovation. The event introduced Postgraduate Informatics students to prospective employers to help them secure a suitable work placement by end of the taught part of their studies. Students on the Postgraduate Informatics courses can opt for a management consultancy or applied informatics management project working as a consultant with an external organisation. "The night not only provided a relaxed forum for networking but it also gave me an opportunity to see how I can adapt my dissertation topic for a consultancy project to benefit a company and also my job prospects after completing my course," said Adam Callinan, MSc IT Management for Business student at LSBU. Representatives from businesses of all sizes attended the event, including Cameron & Wilding, Silicon Thoughts, Digital Detox and Ripmax. "It was great to be able to connect with a number of other companies, lecturers and students. Working to bring all those parties together is a great move by the University and we look forward to more events in the future," said Ben Wilding, Managing Director of Cameron & Wilding. "The Informatics department is at the forefront of engaging students with enterprise activities. 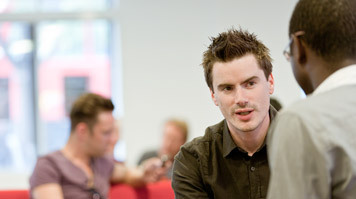 The postgraduate informatics courses firmly embed employability and enterprise initiatives into the curriculum. Over the last few years participants have benefited from career management talks, industry master classes and enterprise event," said Dr Jeffrey Chang, Programme Manager for Postgraduate Informatics Studies. By joining up with Research, Enterprise and Innovation, the Informatics Department has provided a variety of activities since the beginning of the academic year, including the Start & Evolve talk series, a Hackathon competition and numerous lunch time talks from successful businesses. "It is important that students feel that these events are part of their course and it is fun to take part. With Employability, they have also provided talks on the current IT labour market and setting up mock discipline-specific interview panels to enhance job-seeking skills," said Jeffrey. The PG Informatics programme has a dedicated enterprise and employability section in the Virtual Learning Environment (VLE) where students are kept up to date with internship and work placement opportunities selected by the course team. Many enterprise-related events are incorporated into the Strategic IT Management and Entrepreneurship module. Leading industry business planning tools are also introduced to students who work in teams to handle real-world scenarios.